The Two Stage Marijuana Detoxification Kit includes a 16oz. bottle of QCarbo Easy Cleanser, one bottle of QPretox Master Concentrated Capsules (100ct), and one THC-Marijuana test device. 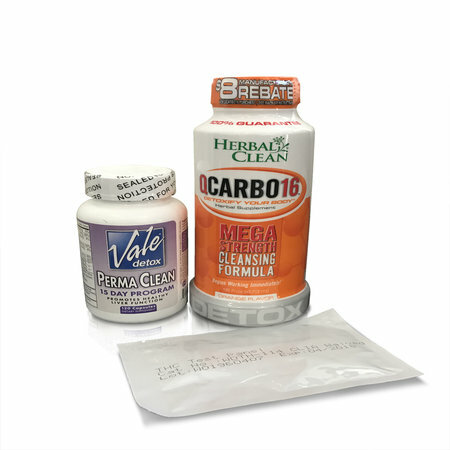 This product set is intended to allow you to prepare for a urine drug screen starting 25 days before your test. The QPretox Capsules are to be used daily while abstaining from drug use. The QCarbo beverage should be used on test day as a fast acting flush. Step 4) Wait 40 minutes and use the self-test device to confirm the results of your detox regimen. Make sure to urinate at least 2 times before testing yourself.